What Do You Want To Be When You Grow Up (Next)? Let’s Find That Career Sweet Spot. My two year old daughter, Norah, is a burrower. Norah sleeps with 3.4 million stuffed animals in her bed. She nestles her body deep under blankets. She curls up in your lap when she’s scared and wiggles in until letting out a little “yes, that’ll do” sigh. Norah is always in search of, and almost always finds, the sweet spot. My three year old son, Jack, is learning how to play baseball. Jack loves to take the wiffle ball bat and balls into the backyard for batting practice. He takes direction well and practices keeping his swing even. He will ask you if he kept his eye on the ball that time. Jack is getting better and better at making contact with the ball and finding the sweet spot. We love to smile sweetly at Norah as she cozies herself in, and duck for cover when Jack cracks a line drive. It feels great as a parent to watch your kid be totally in the zone and feel like their stars are aligning. What’s My Career Sweet Spot? Finding the sweet spot as an adult can feel a little more complicated. How do you even start to think about what your career and life equivalent of cuddling many teddy bears and Mom jumping up and down celebrating your athletic achievement is? Let’s loosen the proverbial pickle jar on this for you and break the career sweet spot down into three areas strengths, passions, and value to others. Have a pad of paper, a Word doc, or the note section of your phone handy? Jot down some thoughts as we go. Or download the cheat sheet! This one is super simple. What are you good at? Let’s start with your book knowledge. You were an accounting major, you’re good with numbers (and I’m incredibly jealous.) Or you studied psychology and you understand the human psyche. Perhaps you were a history major and because of some pretty epic papers you wrote on the Byzantine Empire you can research and write like a pro. Those are well developed and well earned strengths. And then of course it’s important to note your street smarts. Are you the hostess with the mostest always throwing great parties for your friends? Do you bake a mean chocolate chip cookie? Are you an active listener? Can you whistle Dixie? Run a marathon? Start a campfire? Train a dog? Don’t be stingy with your list. Just because no one is paying you $45 million dollars to tell jokes doesn’t mean you aren’t funny. If your current job doesn’t require your creative juices, that doesn’t mean they aren’t flowing. Give yourself some credit. Write them all down. Some passions are going to roll right off the tongue. Maybe it’s your family, your faith, your sports team. Or it could be volunteerism, world cultures, art. If this is easy for you – awesome. Write them down. But sometimes the word “passion” feels too heavy. I mean, I like things, but am I “passionate” about them? So let’s try something different. Make a list of all the things that you ENJOY doing. ALL of them. Yup, I’m talking about putting “watching Real Housewives” on your list. I’m saying put “singing in the shower” on your list. Don’t hold back or be embarrassed. This isn’t your passion list yet. And you don’t need to show this to anyone. Now take a second pass, and without any judgement, try to pull out some themes. Love watching The Bachelorette, reading the Skimm, and texting your friends? Why do you like those things? Maybe a theme here is that you like to feel connected with others. Talking about the show the next day at work, reading news highlights, and catching up with your friends helps you do that. Maybe it is that you love the live tweeting audience of The Bachelorette, appreciate the funny movie quote Skimm subject lines, and like hearing your friend’s latest hilarious story about the time she tried goat yoga. The theme here? Humor! Try to come up with several themes that tie together a few of your interests. There’s the start of your passion list. Your CURRENT passion list. It can change! What you are good at is important. What you love doing is important. When you combine those two things then you get close to the sweet spot. But I think the value to others piece is the secret sauce. Now you don’t need to be building houses with Habitat for Humanity, or donating blood every other week, or curing the world of horrible diseases to add value. Not that you shouldn’t do those things – do those things too! Please! But there are a myriad of ways that you can add value to others. Let’s say you are a stay at home parent considering taking on another job, but you don’t know how your experience translates to working outside of the home. In the time you’ve spent with your kids you know all the ins and outs of cloth diapers, or researching preschools, or navigating food allergies. Maybe you found a great way to convince your kids to eat their vegetables or have been to every playground in a 20 mile radius. Think of how much value you add to your family’s life. Think about how much value you can add to new parents in your area, a local business trying to attract parents of young kids, or a company that needs a multitasking pro. A person can add value by making others feel comfortable, sharing their knowledge, offering a service, building a product, listening intently. Get that pen and paper back out and make a list of things you know how to do or know about that add value to those around you. 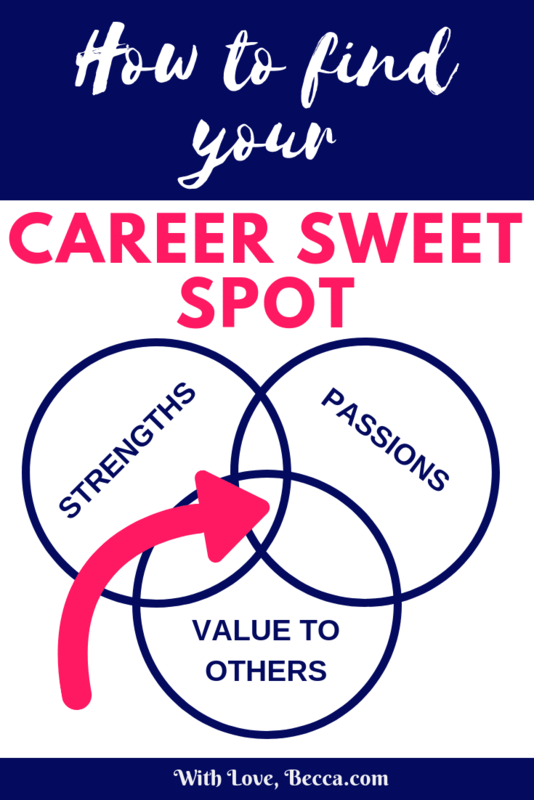 Your Career Sweet Spot – It’s in the Overlap! The Career Sweet Spot is where your strengths, passions, and value to others overlap. Where it feels like your worlds are colliding and you can get into flow. The work you do is challenging but in a way that gets you fired up because it’s rooted in your passions, what you know you’re good at, and contributing something to the world. For me, this blog is my sweet spot. I’m a strong writer, I’m passionate about humor, my family, and helping others succeed, and I can add value by sharing what I know about career development through relatable parenting stories. Finding that sweet spot? It’s AWESOME. Lyndsay found her career sweet spot in photography. She loves taking pictures, she is skilled in working with people, and she offers a unique perspective that results in beautifully captured memories for the families she works with. Scott found his sweet spot in creating Quinn’s Cookies. 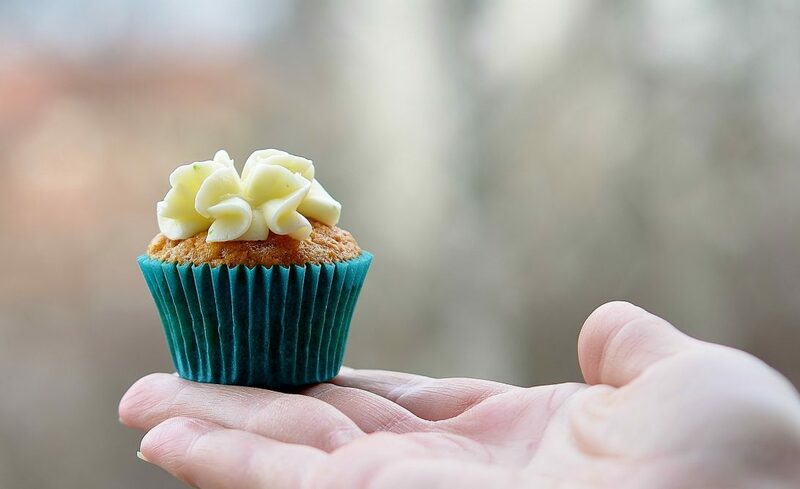 He loves to cook and bake, he has honed his entrepreneurial skill sets in several different ventures, and he has created something delicious that helps women who are struggling to produce enough milk when breastfeeding. 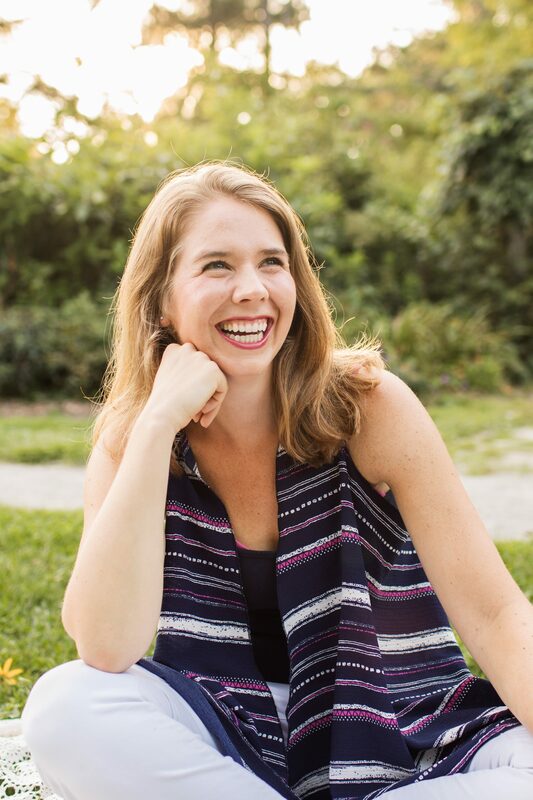 Lindsay found her sweet spot in writing her recently published book. She is a very skilled writer, is passionate about her faith, and can share her experience raising four kids with others who are learning this parenting gig as we go. 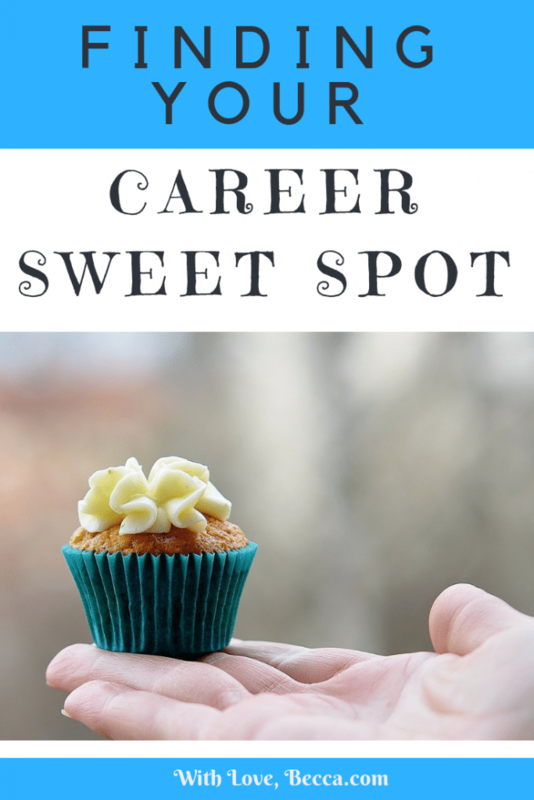 Your career sweet spot is there – promise! Just like Norah’s teddy bear filled bed, or Jack’s wiffle ball bat. You just need to do the work to uncover it. Then go for it. Looking for more career development exercises? Check out 100 Jobs!